When you prepare the deals, always be careful who is the dealer and how vulnerability changes! 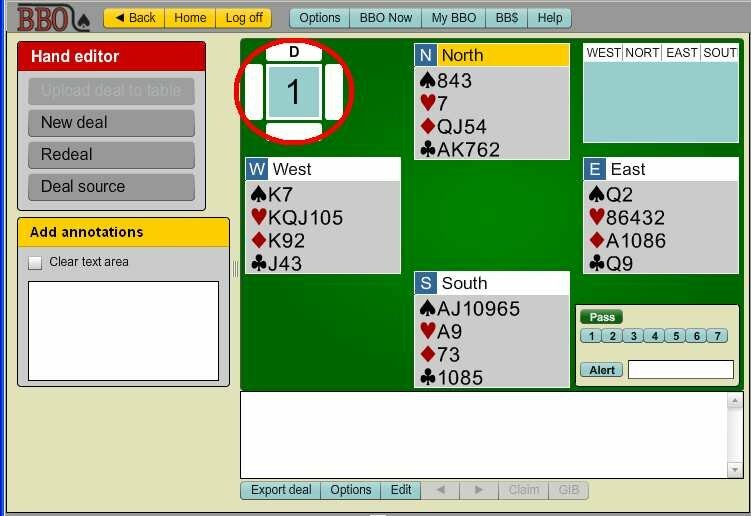 If you intend to save the deals you are preparing one after the other, in a certain order, in a single folder, and then use this folder for a teaching table or upload it to a tournament, beware that the vulnerability, declarer or board number shown on table will change automatically according to Bridge Base Online (BBO) defaults. This means that if you loaded two hands in a row with North declarer and all vulnerable at a teaching table, for example, you will see Board 9 right after Board 1. If these deals are loaded to a tournament, the vulnerability and dealer will be changed automatically. So your second deal with North dealer and all vulnerable will switch to East dealer and vulnerable versus non vulnerable. The software helps here: Dealers rotate clockwise, and vulnerability is marked with red and white in the top left corner of the screen, in a small square. This order is easy to find in the Hand Editor, by simply clicking on the vulnerability until the board number is displayed correctly. All this should be respected only if you want your table to show the deals in order: 1, 2, 3 etc. Also, you need to take this order into account when preparing folders for tournaments. Since Flash's ability to access the user's hard disk is severely restricted due to security concerns, the process of converting hands generated in other programs and stored on your computer is, at the moment, rather torturous. It is preferable to use the Hand Editor to create / generate / edit hands for the lessons, but here’s a solution to convert your .lin files in web format. You need two computers. One of them should have the old BBO installed – the one where you saved previously prepared deals. • Log in from the Windows version and start a teaching table. Load to the table the hands you wish to convert. • On the other computer, log in from the web version, with a different username and join the teaching table you opened with the Windows client as a kibitzer. • On the Windows version go through the hands you loaded to the table – just click on Send to load each deal to the table and pass them out to go to the next hand.